I asked our office manager Ashton Wells to light the enemy candle this week so I could take this photo. It wouldn’t light?! Go figure. For several months now we have begun worship with a candle lighting prayer/ritual. We light a flame of love within ourselves, we light a flame for our loved ones, our neighbors and yes, even to our enemies. 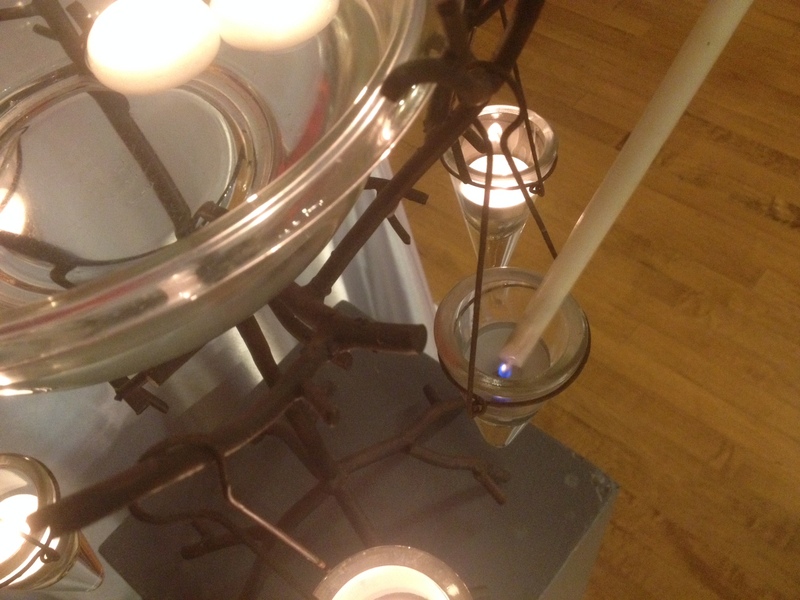 Offering light to those we dislike, even hate, is……well, complicated. And yet Jesus often told those who would listen to love our enemies and to pray for them. We are not to smother another person’s light or potential for light, even when we have been wronged. Easier said than done. It is relatively easy to enter into prayer for causes or persons that engage our care, but we are bidden by the teachings of Jesus Christ to pray not only for our friends, but for our enemies. This would also be easy if in fact we were always open and loving to those whom we have reason to consider our enemies, but the reality is that we often return the feelings of enmity. In cases where the perceived enemy is a different country or ethnic group, then we easily demonize the enemy so as to more “righteously” destroy in a “just” war. In cases of personal injury our natural attitude is to hope that the other will suffer even as he or she has made us suffer. In other cases the injury has been violation of an innocent one, such as in child abuse, and our feelings toward the one who has so violated the dear child are rage and indignation. We do not wish this person’s well-being! When we are victims of crimes, we tend more often to will the ill-being of the violators. There is seldom great release in such praying, since we are in the grip of hatred. But my experience is that responding to my wishes for vengeance with a prayer for the other’s well-being actually begins to release me from my own participation in hatred and transform me. God universally desires well-being, and God desires my enemy’s well-being. Should I not be in conformity with God’s own great will toward well-being? …The prayer that begins begrudgingly can slowly become a willing prayer, till at last we know the release of being one with God in praying for the other’s well-being. Are you in the midst of conflict with someone? Do you feel wracked with anger over a situation that feels out of control? Where and how are you experiencing the smothering of light? How are you contributing to the smothering of another person’s light and well-being? Thank you, Ruth, for your prayer for Gaza and Israel read on July 20, 2014. We pray for friends and enemies . . .